I recently participated in #PRStudChat, a recurring discussion between PR experts and those looking to learn on Twitter. It was then that Simon and Breakenridge developed the idea to host and moderate a chat session on Twitter for students. It was their intention to connect students with professionals and educators directly to discuss firsthand the practice, career, and business of Public Relations and what it takes to be successful in this industry – today. 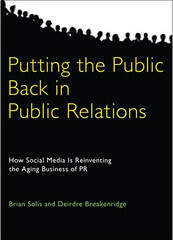 The business and practice of Public Relations is experiencing a profound metamorphosis. This is indeed a momentous time in our lives where we each can benefit by assuming the role of students. I wanted to share with you the questions and answers posed during my participation…please note that these answers were edited slightly to make sense outside of the Twitter stream. Or you can follow the discussion here: #PRStudChat. 1. What happens when you no longer believe in a client or the issue you’re representing? I believe that when you lose conviction about what you represent, you lose passion and that screams in everything you do. Life is too short not to be inspired and inspiring. 2. What should be included in a PR portfolio? As an employer, I would love to see what you read, your ideas, online experience + your a representation of your professional connections. Then, examples that demonstrate action from A to B. Your digital portfolio now also includes not just what you say about you, but what’s said about you now. I would also love to see why you “didn’t” include press release examples in your portfolio. Tell me a story outside of a template. Information. Direction. Answers. Build a portal to communicate facts & updates. Find the beacons & recruit their help. 4. What should you get out of a PR internship and what should you expect? I believe that shadowing an experienced person is far more valuable than getting thrown into work directly. We need context. Experience is priceless. Write for reporters, write for bloggers, write for social consumption, and have it run through the mill. Research. Read. Immerse yourself. 5. How important is continuing education, i.e., APR certification? Continuing education is valued in how the subject matter applies to the state of the industry. Sometimes experience IS the education. Nothing replaces the value of knowledge. If we stop being students, we stop learning. Ambition, passion, & curiosity speak volumes about you + your work & ultimately serve as the harbinger of your success. 6. What are some non-related PR classes beneficial to the filed of public relations? Kindle users, subscribe to PR 2.0 here.